Primatech 250AR – Adjustable Base Version w/PrimSurfer | Hy-Cor International Inc. The PrimSurfer roller base fulfills the need for increased Speed and Precision in large surface as well as residential flooring jobs. Its two-way fluid sideshift extends the natural hand movement and matches the agility of the installer, allowing a constant, comfortable posture that helps eliminate “top nailing”. Not having to lift the tool repeatedly eases off the feeling of tension in the user’s arm and back. PrimSurfer also provides a substantial gain in time and installed surface, which translates into more benefits for the contractor. 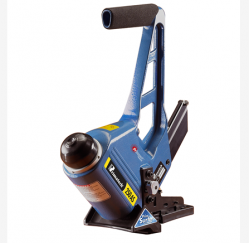 First to develop and perfect this groundbreaking addition, Primatech keeps improving it with a new generation composite and lighter carrier frame for its adjustable DIY, PRO and EXPERT series flooring tools. Available in three configurations: S (stapler) L (“L” cleats) or T (“T” cleats). Model 250ASR Stapler shown.